Green tea with ginger and golden syrup flavour. The Taste... The sweet aroma of a traditional cake shop. The tangy warmth of gingerbread, baked to perfection. 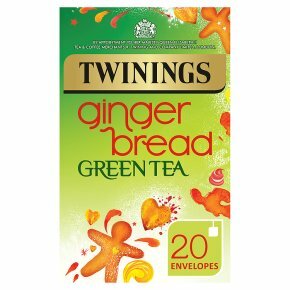 With real ginger pieces and golden syrup flavour, this is an entirely new take on traditional green tea. One that's utterly surprising... yet wonderfully familiar. Brew Time... We suggest brewing this tea for a maximum of 2 minutes, any longer and you'll lose the delicate taste. Allow one bag per person and add freshly boiled water. Always best enjoyed without milk.